Projected top-3 draft pick Joel Embiid is set to declare for the 2014 NBA draft according to Yahoo! Sports’ Adrian Wojnarowski. 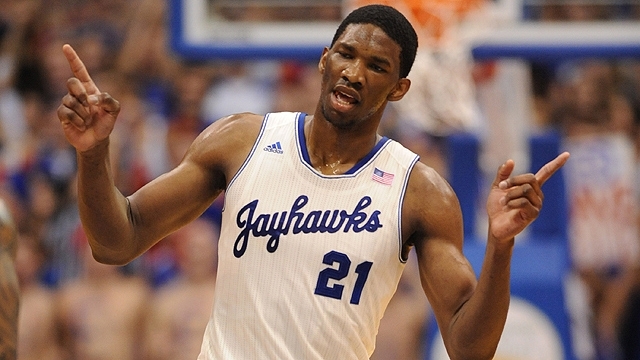 Kansas freshman sensation Joel Embiid intends to enter the 2014 NBA draft, sources reportedly told Yahoo! Sports. The 20-year-old, 7-footer saw his stock skyrocket during his lone season with the Jayhawks and is a projected top-3 pick in the upcoming draft. Some scouts have even suggested that Embiid could upstage fellow freshman stars Kansas teammate Andrew Wiggins and Duke Blue Devil Jabari Parker as the first overall selection on June 26. It has long been common knowledge that Wiggins only intended to spend one year in college, while Parker has stated he is still in the midst of making his decision. Likewise, Embiid is yet to make a formal declaration, but according to Wojnarowski, sources close to the 20-year-old have said he “has progressed in settling on agent representation”. Embiid has refuted the claims via his Twitter account, but you shouldn’t expect much else him before any official announcement is made. Embiid’s season was cut short due to a stress fracture in his back. The injury kept him from playing in the final two games of Kansas’ regular season, the Big 12 tournament and the Jayhawks’ two games in the NCAA tournament – Kansas (the No. 2 seed in the South) was eliminated by 10th seeded Stanford in the round of 32. Despite the injury, Embiid is likely to receive a large amount of interest from the teams with high draft picks. During his impressive freshman campaign, Embiid showcased excellent defensive instincts and an intriguing offensive game with huge upside. His ceiling is amongst the highest in the draft and it would not be surprising to see a team invest the first overall pick in his stock. Embiid averaged 11.2 points, 8.1 rebounds and 2.6 blocks in 23 minutes a game for Kansas this season.